James de La Salle is from CIL’s construction and building products practice and is responsible for CIL’s construction forecasting. His presentation provided a fresh perspective and a positive business and economic outlook for the sector, with an interesting exercise on the collective uncertainty that we are experiencing, by using examples of ‘Myth v Reality’ from UK Media. The afternoon sessions were dedicated to mental health in the workplace. First to take the stage was Martin Coyd, OBE from Mace Construction. Martin delivered an engaging and entertaining but thought-provoking presentation for the second year running on mental health in the workplace. 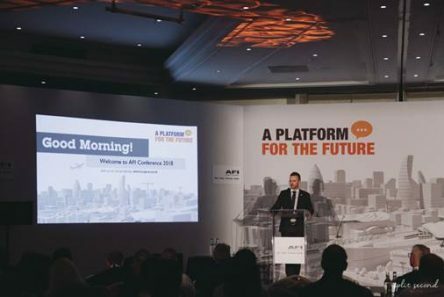 He outlined the fact that although mental health awareness within the sector has improved dramatically in the last 12 months, over 400 construction workers still take their own lives each year. Special Guest Speaker, Alastair Campbell the former Director of Communications and Strategy in Tony Blair’s Labour government, closed the conference with a twist. Having heard the afternoon’s presentations on mental health in the workplace, he took to Twitter to announce that he was going to speak about his issues on mental health, drawing from his own experiences and the challenges he has faced throughout his career following a mental breakdown in 1986, and subsequent bouts of depression and addiction. “Change is happening, and I really feel we are close to the tipping point in terms of people’s greater understanding and society’s greater openness about mental illness.” Alastair saved his planned speech on Brexit and the rationale for a second referendum for after the evening dinner and delivered a thoroughly controversial yet, thought-provoking close to the AFI Conference 2018 event. Examples of innovation on show at the conference included a virtual reality simulator and our CatchZone safety innovation, an accessory designed to prevent tools, equipment, and other work related items being dropped from Scissor Lifts. Special thanks to our gold sponsors – SkyJack and JLG & silver sponsors – Sterling, Dingli, Platinum, Genie, Trackunit & Haulotte.